My friend at work (who speaks fluent French) lent me some French movies last week. I’ve been trying to get a good mix of movies from different languages and countries, but I’ve really enjoyed every French movie I’ve watched. I don’t know if French film is generally a cut above the rest or if the only ones I have access to are the best ones, but either way, I’m enjoying myself (and eating a lot of crepes and baguettes). 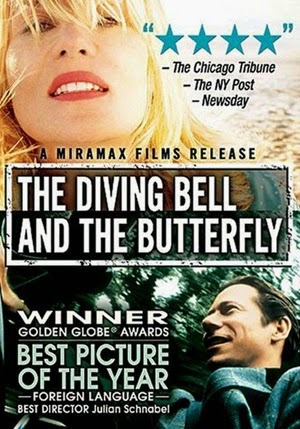 Based on a true story, The Diving Bell and the Butterfly is about Jean-Dominique Bauby, a successful magazine editor who suffers a stroke and must learn to live with locked-in syndrome, which leaves him unable to do anything but blink and, eventually, move his head a little bit. With the help of a physical therapist and a speech therapist, he utilizes a new way to communicate. Someone recites the alphabet in order of frequency, and when they reach the appropriate letters, he blinks once. And so on until he communicates first a word and then a sentence. In this way, he undertakes to write a book about his life. It’s a beautiful, quiet film that touches on how and what we value in life. Communication is oftentimes taken for granted. With email, texting, phone calls, Skype, and other things, we don’t even have to be in the same room or the same city to have a conversation. As a writer, I think it’s important to recognize the weight that words can and do have and to be mindful of how we communicate.